I know I say it every year. But, you are growing up. 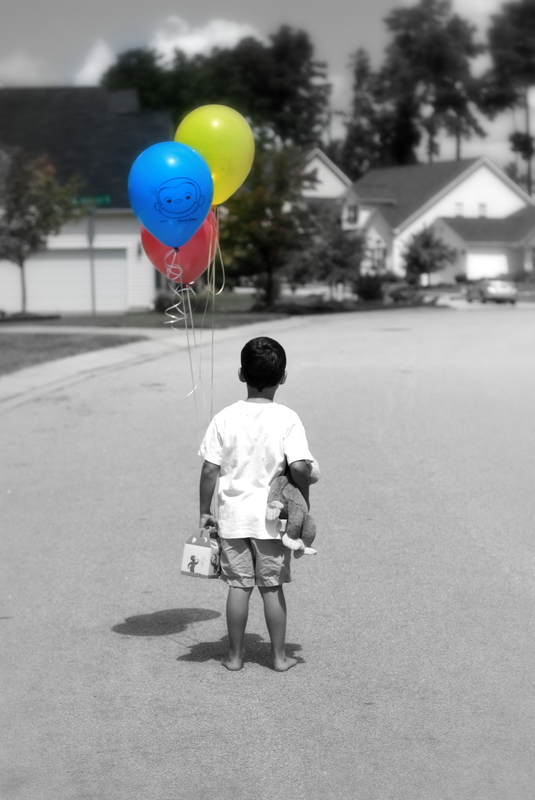 Things are changing for us and in us, and my boy, you are a big kid now. It’ll always be hard (maybe impossible even) for you to understand … the way the changes in you effect my heart. I know it’s natural for you to pull away. I know it’s normal for you to drop my hand when you think others are watching. I know big guys might turn away from their momma’s kisses every now and then. I know. I just didn’t think it would happen to us … not yet … not so soon. My poor momma heart can’t handle it. You are my N bug. My first baby. We were always connected in a special way. The thought of that bond being severed in any way is just more than I can take. You are the one who has and is teaching me so much about life and love. And I know I’m making this birthday letter all about me and my poor, raw feelings right now, but oh my love, you are my heart. My biggest life lesson right now is mostly about allowing my heart to stretch and let you go a little bit more and a little bit more. You’re SEVEN! You’re in 1st Grade now. 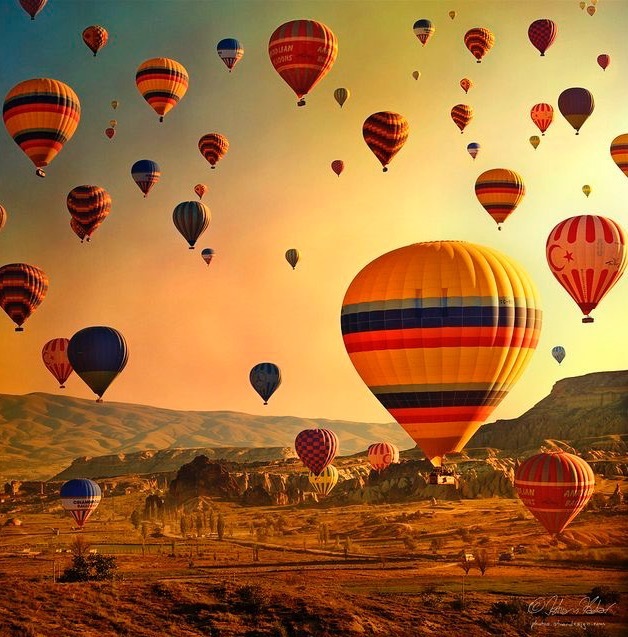 You are learning what spreading your wings might look like. What it might feel like. I shouldn’t be so surprised. My boy, you amaze me in most all the ways. You are smart. You are funny. You are kind and caring. You are witty. You repeat quotes in movies, while the movie is STILL playing … just like your daddy. You are creative. You are silly. You are quiet. You are observant. You are tender. You are loyal. You are logical. You are strong. Climbing. Trees. Walls. Light posts. Anything. Always climbing. Riding your bike. Fast and confident and sure. Always riding that bike. Playing. Playing Beyblades or trading Pokémon cards. Collecting. All the junky toys. All the time. Building. Legos, creations, forts, etc. Snuggling. Under “brown blankie” or your “monkey mat”. Swimming. Around the pool with your snorkel on. Doing cannonballs into the pool or crazy moves down the slide. Buzz cut. Your current ‘do. Thinking. That mind of yours is always going. Always thinking. Always planning. Reading. We still love to read together. Our books have evolved over the years. I’m holding on to that. Being. I love to just BE with you. So, while I miss (sometimes almost wildly and unreasonably) the way we used to snuggle under a blanket and watch Curious George together for hours on end … all tangled up together, I do cherish and adore our relationship now … just as much. I love our conversations and how we talk. I love the little man that you are. I love our “dates”. I love how your mind works. Always thinking, inventing, listening. I love you. All of you. Every stage of you. Every year of you. To the moon. For all time. Oh, Little Miss, it’s been quite a year. 3 was not easy. One day, maybe you’ll find out and you’ll understand. Maybe when you’re a momma, just like you want to be (“I want to be a Mommy when I grow up”), you will struggle through “3” with your own littles. And, I will be there, God willing, to help you through it… and to laugh a little bit along the way. At 3, you tested me in every way imaginable. 3 was hard. For both of us. In a lot of ways and for a lot of different reasons. But, we learned and we grew and we cried and we yelled and we prayed and “we” read parenting books and we tried and tried again … and we made it to the other side. We did it! We did it together, my girl! Now, we’re at 4 and oh, how I’ve prayed for a better year for us. We are close, you and I. We spend most of our time together, happily so. School (preschool) is not your favorite thing … it never has been. And, so you go … reluctantly … but you’d rather be home. You are my little homebody. You love our “outings”, but you’re always ready to go home. “Can we go home now, Momma?” You want home. You crave home. Familiar. Comfortable. Happy. Safe. Secure. Fun. Warm. I’m so glad that these are the things that HOME means to you. My heart beats stronger knowing that I’ve created a happy refuge for you. Oh, my girl. You love to just BE. You want freedom and peace and rest and quiet. You sit and play with your toys for long quiet hours and it’s in your play where I learn and listen and hear the most of who you are and how you see your own world. Though you often catch me watching and say, “Don’t look at me!” … I have to listen. It’s where I find the details of your day and your life … listening as you play and talk with your toys, your “girls”. Twirling and dancing in the kitchen, in the backyard, on the sidewalk. Singing loudly (to your brothers dismay) in the car … everywhere we go. Making up your own tunes, your own words, your own grand stories. Dresses and tutus and frilly skirts and princess gear. Messy hair and messy hands. Running with a soccer ball like a natural little athlete. Cute and disheveled … all at the same time. Bossy and demanding. Trying to “rule the world”. Getting lectures about being kind and nice and showing others grace. Listening to Zac Brown Band’s “Homegrown” and knowing all the words. Laughing hard and loud when something is funny to you. Asking for a snack. And, another snack. And, more milk. Did I mention the messy hair already?! Ha ha ha! Asking for your daddy in the morning … you want him to sing his special morning song to you before you get out of the bed, each and every day. Heartbreak over saying goodbye to your beloved paci. Bunny and Blankie — your best friends forever. Wearing your Cubbie vest to Awana and proudly learning your Bible verses. All the pink. All the time. Playing with your neighborhood friends … just like a big girl. Kissing boo-boos and needing lots of band-aids for imaginary scrapes. Holding hands and holding hearts. Oh, my sweetness. If I could keep you little, I would. I’d keep you soft and squishy. I’d keep you all to myself. I’d keep you home, away from the world. I’d keep you as safe as I possibly could manage. I’d keep you. I’d keep you just the way you are … the good, the hard, the messy, the imperfect, the beautiful, the funny. I’d keep you, always. But, grow and go you must. It’s just the way, my love. But, I’ll be here … my heart is yours to keep … always, always. No number of birthdays will ever take that from us. Happiest 4th Birthday, Baby Girl! My girl. It’s your birthday. You are three. I can hardly believe it, and yet at the same time I can hardly remember what life was like before you. Isn’t it funny, how it works like that? There are days when I honestly can’t picture us before you. Your personality is big. Your presence is not easily overlooked. It’s hard to imagine our home without you in it. You were a sweet, easy, sleepy, happy baby. At 3, you are a little tougher. These days you aren’t always sure what you want but you ARE always sure what you don’t want. In fact, “don’t” is one of your favorite words right now. “Don’t look at me. Don’t touch me. Don’t look like that with your face.” It’s almost comical, but “don’t laugh” and definitely “don’t talk.” You ask a lot of us. You definitely want to be in charge. But, despite your naturally bossy nature and your general dislike of all the things, your tender heart shines through. You love your people and you always make sure we know it. You have my heart. You always will. From you I’ve learned that things aren’t so complicated. That things are more straightforward. That we don’t have to make things harder than they actually are. That “poopy does hurt and poopy does stink.” Lol. Your words, little girl, your words. You are bright and loving and witty and cute. Your sense of humor is sharp and quick. Your hugs are hard and full of love. You are demanding and bossy and sensitive and silly. Your smile can light up a room … and a heart. If you are having a bad day, you want to make sure that everyone else is to. You are slow to warm up to new people, but loyal and kind to those you call, “my friends.” You are super girly, but never afraid to play rough. You like soccer. You like running. You are sweaty. You are fun. You don’t like boys. You don’t like anything that looks like it might be “too boy.” My girl. You are so, so many things. If I could bottle you up, I would. I love our days together. Just me and you. We quietly pass the time or we go out and about in the world. Either way, I love having you right with me. You are my sidekick and I hope this sweet time with you passes slowly. I’m not ready to let you go. I’m not ready to watch you grow too big, too soon. You are our wildflower. Once you taste freedom, I have the suspicion that you’ll only want more of it. So, for now, stay little. Hold my hand a little longer. Enjoy age 3, with me tagging along. Baby girl, I wrote the poem below a couple of years ago. It was shortly after you took your very first steps. On your birthday, sweet love, I wanted to share it again. I want you to know and to always remember that you’ll always be enough for me. Just the way you are… you are enough. You may wonder if you are enough. You may wonder why you weren’t enough for him to love. Remember that you are enough. You are loved. You are adored. My love will always find you. You are always, always enough. My sweet boy. You are 5 now. Whenever I pause to reflect on you; to write to you – my heart gets caught in my throat and I always have to stop and have a good cry. It’s just … the way I love you has always amazed me. The way I feel about you can never adequately be expressed. It’s soo much. It was a little cooler today and I noticed some of the leaves changing as A and I drove to pick you up at pre-school. Fall always makes me feel more sentimental. I caught myself feeling overcome by mixture of happiness and sadness. I have loved your littleness. I have loved baby N and toddler N. Raising you isn’t always easy and we have days that feel desperate, so raw and so hard. Yet, there is so much beauty in it. There is so much life in it and ridiculous amounts of joy. I have a wonderful time with you. You have made my life so meaningful. It’s strange to me that you are 5 now. Already. It doesn’t seem quite right. You should still be my little guy, but you are growing and changing every day. You are a kid now. It’s hard to let go and watch you grow. Yet, I’m so proud of you. And, though it’s hard for me at times and I yearn to wrap you in my arms and keep you little, watching you grow has been so rewarding and fun. It’s my favorite thing. At 5, my boy, you are full of life. You are smart and imaginative. You are innovative and full of ideas. You are kind and tender-hearted. You think “stupid” is the worst “bad word” there is and you truly strive to use only “kind” words. You are easily frustrated, but mainly because you want to be able to do all-the-things. You are funny and goofy. You make us laugh. You sorta play soccer. Sorta. You love pre-school. You adore stuffed animals and have more than any child should. You struggle with greed … caused by your desire to have all the stuffed animals in the world. Ha! You are a comfy clothes wearer. Silly story teller. You are becoming a good little artist and not a bad little carpenter. You still want to be a construction worker when you grow up. You take good care of your sister and y’all are best friends, but you also like to tease her and sometimes you make her cry on purpose. You feel strongly about all the things. You. I’ve never loved anything more. My boy. My heart. 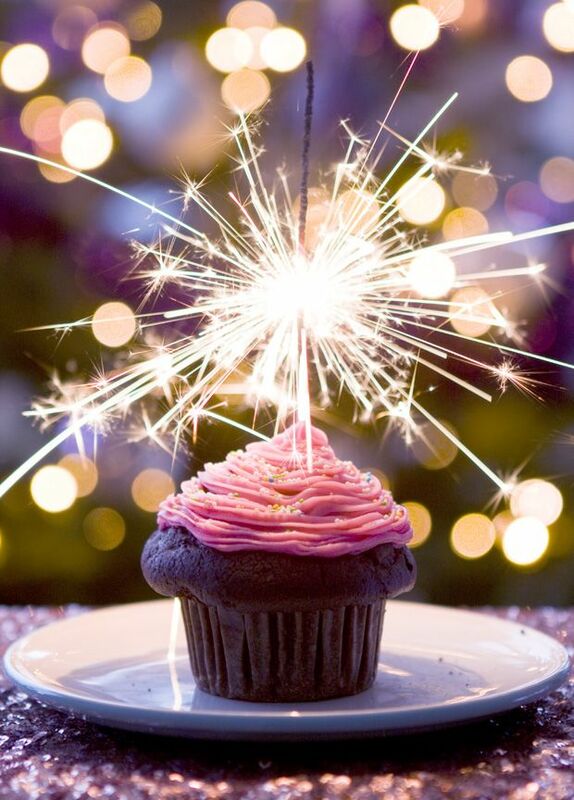 It’s your 4th birthday and there are things that I’d like to share with you. Things that one day, maybe you won’t remember. Things about your life right now, as you turn 4. Things your momma tells you now, but they just might matter more to you later. First: You should know how positively crazy your daddy and I are about you. Yeah, I know we may act like you drive us crazy sometimes … and you do … which you should also know if perfectly normal and typical and we wouldn’t have it any other way. But, despite that, we adore you. We marvel at you. We are impressed by you. You are growing up and growing into yourself. God gave us YOU! And, we couldn’t be more thrilled. We see you. We like you. We love you. Second: You are so sweet to me. You love me so much. I’ll always be grateful for your love. It’s the most special thing in my life. I never even knew, or imagined that a love like yours existed. You say you want to marry me. You say you love me to the moon. You say you’ll love me forever and ever. You say that you love me more than anyone else in the world. You melt me. My tears flow freely because my heart can’t hold all of the love you give me. Your love makes me strong. Your love makes me better. One day it won’t be like this. One day you’ll discover other interests or sports or friends or (gasp) other girls. One day I won’t be your whole world. Until then, I will CHERISH being your favorite – being the one you adore. I cherish it. Third: You are seriously good at being a big brother. Maybe you don’t love to share. Who does? Maybe you get upset when A drools on your toys. Who wouldn’t? But, you sing to her in the cry when she’s upset. You sing, “Every little thing is gonna be okay.” You sing it over and over and over, in your sweet, magical voice. And, it works. It works almost every time. She stops crying, your little sister, and she watches you and listens to you. You soothe her. Fourth: You still love George. He’s your guy. For an entire year, your stuffed Curious George has gone everywhere with us. And, I mean EVERYWHERE. He never stays behind. At first, he was your security. He helped you be brave when you felt shy, insecure, scared and worried. You needed him and he was there. Now, though, I see a shift. You don’t need George in the same way. You are becoming braver all on your on. You are changing. George is still there. He still goes everywhere with us, but it feels more like a habit. Part of your routine. The way things are done. I don’t think he’s your security anymore. I don’t think you need him. I think you’ve got this. You got this, my boy! Fifth: You have a mind of your own. I’m not sure I need to say more. You pick out your “comfy” clothes each morning and you prefer matching … as in, orange on orange or head-to-toe green. You like things a certain way. You are Mr. Particular. Your imagination is really taking of now. I love watching this new change in you. Now, you spend your days stuck in a parallel universe somewhere between “real” and “pretend.” It’s pretty fun to witness. Sixth: I think 4 is gonna be an awesome year. It’s only been one month, but already I sense a difference in you. Okay, I don’t just sense it … it’s plain as day. You are actually listening to me, responding, doing what I ask without complaining. Leaving me to stare at you with my mouth open wondering if someone has snatched my 3-year-old non-listener. Oh yeah. Someone has. It’s this 4-year-old. Hi, 4-year-old Noah. You. Are. Awesome. Seventh: You are my best friend and one of the very greatest loves of my life. I thank God for you daily. I love you beyond measure. 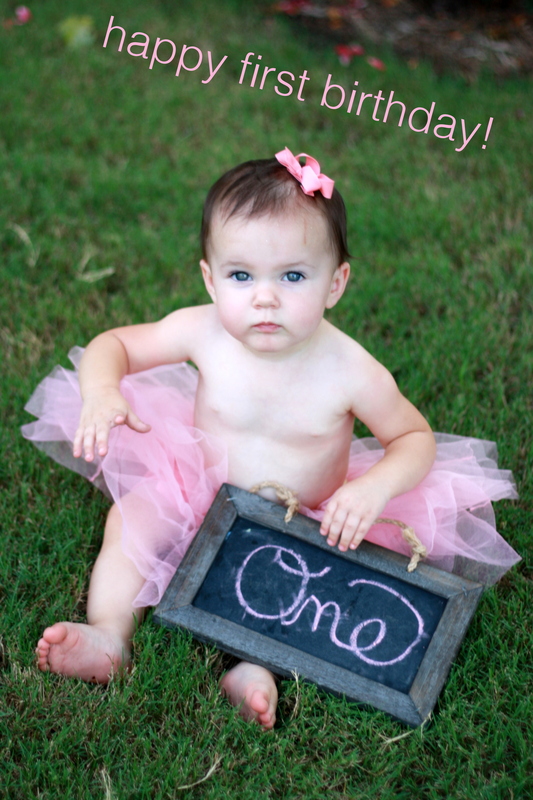 Last week, I shared my letter, To My A, on Her 1st Birthday, with you. As is my style, it was sentimental, a bit sappy, and loaded with momma love. But, there was more to her birthday than just me being emotional. So, today, I want to do something a little different. I want to share the PARTY! 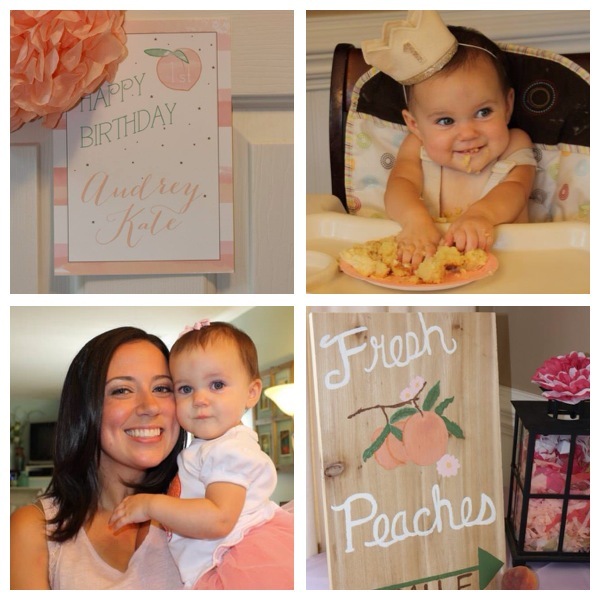 To celebrate our A turning ONE, we threw a our “Peachie” a “Sweet as a Peach” party! Yes, yes, I’ll fill you in on the background of “Peachie” and her unique party theme — When I was pregnant with A, N was really into watching Ice Age: Dawn of the Dinosaurs. In the movie, the woolly mammoth couple (Ellie and Manny) are expecting a baby. When she’s born, they name her Peaches. Thus, N decided that our baby should also be named Peaches. 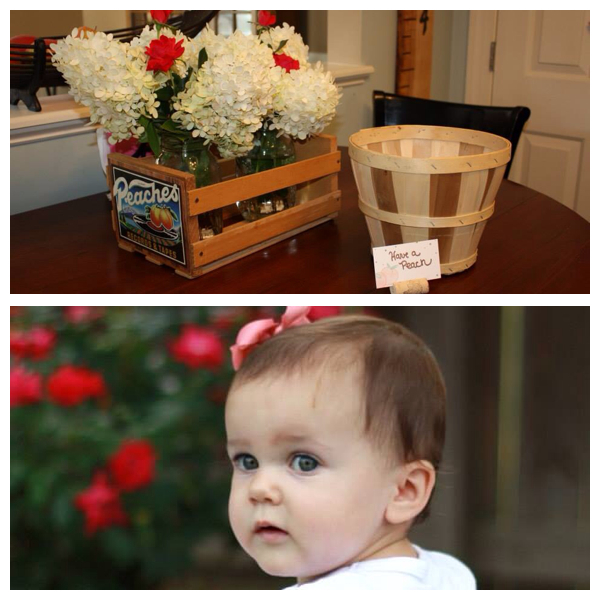 Throughout my entire pregnancy … and for the first 10 months of A’s life, she was known as Peaches or Peachie. One day, N just stopped calling her Peachie. Just like that. No explanation, no anything … he just started using her real name. I don’t know why. It’s just one of those things, I guess. Still, a little piece of my heart broke off, I think, as I realized they were both growing up and moving on. Sigh. 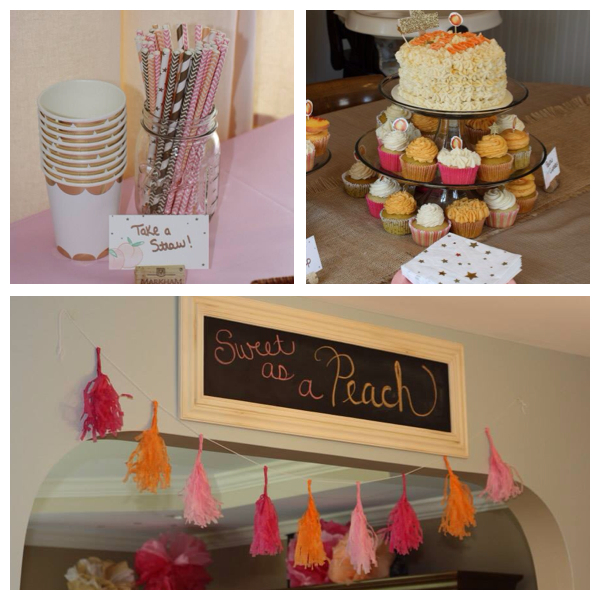 Anyways, SO, once I started planning the party, I kept thinking about our Peachie … and a theme was born! 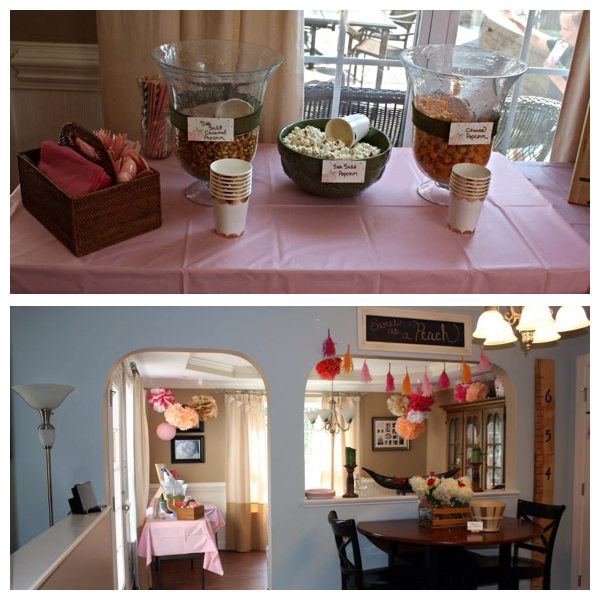 It was truly an event … fun, happy and lovely! Perfect for our girl!